Kate Middleton is positively ravishing in red! The pregnant Duchess of Cambridge stepped out in Scotland on Friday, April 5, for another round of royal engagements with her husband, and -- as has been the case so often recently -- she kept her growing baby bump mostly hidden under a chic coat. But this was not just any coat. 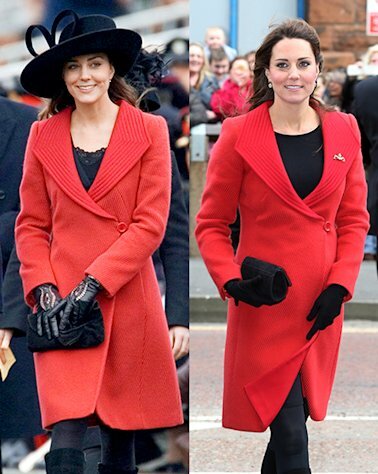 This was a red Versace coat -- the same red Versace coat, in fact, that she wore to Prince William's passing-out parade at Sandhurst back in 2006. (A passing-out parade is a military tradition commemorating a recruit's completion of basic training.) At the time, Middleton's attendance at the event was a big deal; it was one of her highest-profile appearances yet as the Prince's girlfriend, and she was there as an official royal guest. Flash forward to a little more than six years later, and the couple are now married and expecting their first child in July. A lot of things have changed -- but Middleton's classic style is not one of them. For her 2006 outing in the coat, the future Duchess wore black tights, black heeled boots, and a festive black hat. For her 2013 outing, she kept the black tights and black heeled boots but traded the headpiece for a Strathearn Tartan silk scarf and black Cornelia James gloves. As Us Weekly previously reported, the royal couple stopped by the Dumfries House in Scotland on April 5. There, the soon-to-be first-time mom was greeted with a startling sight -- herself in doll form. "No! Oh no, is that me? Is that meant to be me?" she asked when 11-year-old Dayna Miller approached her with the lookalike figurine. "Does my hair really look like that?" Miller assured the Duchess that she was significantly better-looking. "I told her she was much prettier than the doll and her hair was not nearly so big, and she laughed and seemed happy," the young girl said later. "I think she was a bit shocked by the doll, though. I can't believe how nice she was. She was just lovely. This has been the best day ever."